Luis Reece will look back on his first-class Derbyshire debut with bitter-sweet memories after he shared a record-breaking stand but ended on the losing side. 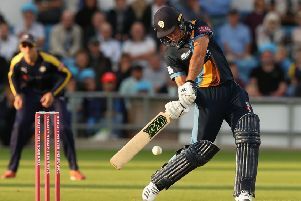 The former Lancashire batsman scored a career-best 168 and passed a club milestone that had stood for 87 years only for Northants to win the game at the County Ground by three wickets off the penultimate ball of the match. His opening stand of 333 with captain Billy Godleman was the highest for Derbyshire, beating the 322 between Harry Storer and Joseph Bowden against Essex at Derby in 1929, and the third largest in the county’s history. The records will also show that Northants donated runs through ‘declaration bowling’ to set up the fourth innings chase but Reece’s innings was forged in difficult conditions against front-line bowlers when he had to earn everything that came his way. What impressed most about the 26-year-old was the sound judgement and cool temperament he displayed in both innings and he recognised the importance of making a successful start with his new county. He said: “It’s always important, when you move clubs you want to establish yourself and the lads have been so good here. It’s a completely different atmosphere to what it was at Lancashire, Billy has been really positive from day one and everyone has made me feel really welcome. “It didn’t work out at Lancashire but if you look round the circuit there are plenty of ex-Lancashire players in different teams. You want to stay with your home county but Derbyshire have shown faith in me and now it’s up to me to reward that by performing. “So far it’s been a transition I’ve thoroughly enjoyed. You’ve always got it in the back of your head that you want to do well early but I work incredibly hard at my game and try and tick all the boxes before I play so at least I know I’ve not left any stones unturned. Reece is also hoping he will get more opportunities to bowl his medium pace after he was given overs ins both innings against Northants. “My chances have been limited throughout my career and the resources Lancashire have suggested I wasn’t needed but I would love to have more of a bowling role for Derbyshire,” he said.